The winners of this year’s Chase Bank Enablis Business LaunchPad Competition were announced at a gala event held at Michael Joseph Centre, Safaricom Headquarters. Pauline Stella Onyango emerged the overall winner after impressing the judges with her elaborate business plan. Pauline runs Stella Gym and Fitness centre in Kisumu and she attributes her winning to her strong feasibility study she did before starting her business in 2009. The study helped deliver unique services to her customers as compared to her competitors. “I am so excited today because I know my business is on the right track. Winning the competition has come at the best time because I intend to expand by business to other parts of the region, said Pauline. She also emerged winner in the tourism and logistics category. Kombani Kinyanjui emerged the best in Marketing and communication category and was the 1st runner up over all. He develops plastic identification cards for institutions e.g. schools, colleges and corporate companies. “This was a last minute entry but I am very happy that we emerged winners in our category. I have gained a lot from the training we have been given and I will use it to expand my business,” said Kinyanjui. 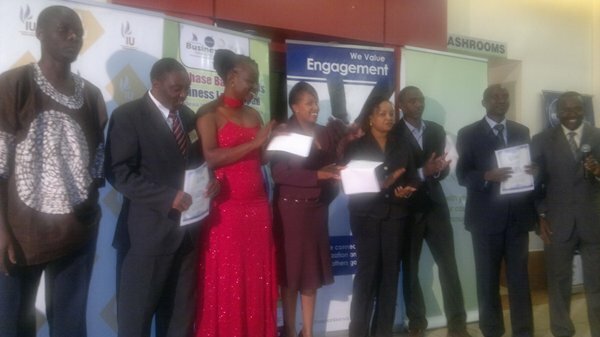 Other winners include Clifford Kimani Mwanja who emerged winner in the Agri Business category. He rears rabbits and involves the community in the farm which he intends to expand to other regions. “Rabbits are very simple too keep. I want to set up the biggest Rabbit farm in East Africa Region,” said Kimani. He also won Ksh 500,000 in this category. The competition attracted over 300 entries, from different sectors including Agribusiness, Green and Ecological sector, Media marketing and communication, IT among others. The entries were received after two month of countrywide training by Inoorero University where the University offered the entrepreneurs a series of training sessions on key areas that need to be addressed when preparing a successful business plan. The participants were provided with a solid base of knowledge in core areas, such as Financial Management, Business strategy, Marketing, Human Resources and Legal aspects of a business. The training sessions also provided participants with hands–on experience and perspectives from business people on entrepreneurship and business start up. This year’s competition showed interesting emerging trends in the entrepreneurship field with the green and ecological business plans recording a high interest compared to last year’s competition. The sector contributed 17% of total 100 shortlisted. However, Agri business had the highest entries, at 27% of the total 1oo shortlisted. The business and professional services and ICT also generated a lot of interest especially noting that majority of the businesses demonstrated a way of incorporating technology in their businesses. “We have seen increased interest in green and ecological business which many entrepreneurs now see as new field to exploit for business, and we also noted that most of the business plans submitted are start ups,” said Mr. Mwaura. Youth dominated the competition with 47% of total shortlisted entrepreneurs being in the 26-35 bracket with another 29% being in the age group between 18 years and 25 years. All parts of the country were well represented, but the majority of the finalists come from Nairobi County with 35%. “The SME Market is a growing and vibrant sector with a lot of untapped potential. As a financial partner we have allocated resources as well as a strong team to grow our SME business and ensure that we take our entrepreneurs to the next level. As the SME Bank, our Bank’s core target is the SME owner who we strongly believe is the driver of this country’s economy. We are therefore proud to partner with Enablis to empower our entrepreneurs to enable them make sound business decisions,” mentioned Mr. Duncan Kabui, Chief Executive Officer, Chase Bank. The competition is an initiative of Enablis Entrepreneurial Network East Africa, in conjunction with Chase Bank, Safaricom Foundation, East African Cables, Access Kenya, Africa Commission, Business Daily, ICT Board and Inoorero University. Did Social Media Bring Chase Bank Down?